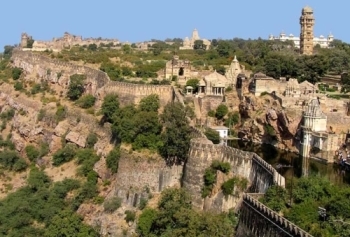 The Hill Forts of Rajasthan are 6 military fortifications built in the Rajput cultural tradition. In 1993 I visited one of these forts: Amber Fort. It was my first trip to India, and I was completely overwhelmed by its street life and visible poverty. Jaipur, the nearest city to Amber Fort, also was the first place we visited on our tour. The Fort is located on the top of a hill, and we walked there in the late afternoon. I remember that it was getting dark when we returned, and that there were lots of local kids yelling at us, walking with us or wanting to hold hands. The fort was built from 1592 and "shows the evolution from the purely defensive fort settlements of the early medieval period to the palace fortress type of architecture typified in the 16th century." It is quite an extensive complex, with several courtyards, gardens, a temple, audience halls and living quarters. My visit was so long ago that I cannot really argue if this is a viable WHS or not. But certainly "palaces" in general are still a very prominent feature of Indian history and culture. The bus from Jaipur dropped me off near the entry to Amer Fort at the bottom of the hill. The entry lies next to a lake and the view of the Fort with the lake is very scenic. 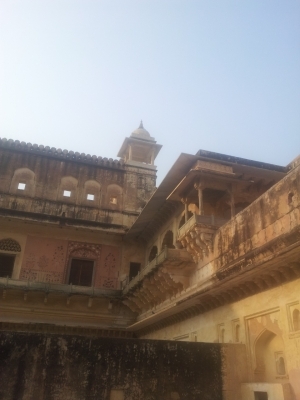 Amer Fort dates to around 1600 and belongs to the Mughal period with major Rajput influences. On the inside it's more of a palace than a fort. After finishing my visit of Amer Fort, I continued on to the top of the hill. There a second fort is located, Jaigarh Fort. At the time of my visit they were shooting a movie, so I only got to see parts of it. I still got to pay in full. And maybe I am now staring in a Bollywood movie. I only visited the Amer Fort, probably the easiest option of the serial nomination. I flew into Jaipur from Bangalore. India has plenty of budget airlines, so you should consider this option. After two nights I traveled on by train to Agra. The train running between Jaipur and Agra is newer than the average Indian train and a lot faster. From Jaipur you can take a local bus to Amer. Amer used to be an independent city, but is now a suburb of Jaipur. My way back to Jaipur was a bit complicated, though, as there were no busses running for an hour or so. And when a bus finally showed up it was fully packed. I managed to squeeze myself in somehow. A visit to the Jantar Mantar in Jaipur is a must. To me a truly astonishing and iconic site. Jaipur also boasts a nice old town with more remarkable structures, e.g. the Hawa Mahal (Palace of Winds). At lunch or dinner you should go for a plate of Biryani. 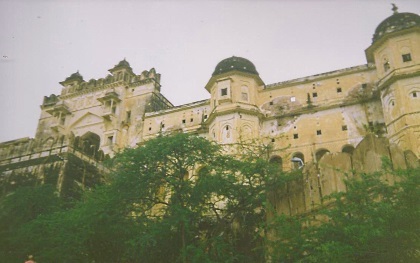 The area around Jaipur also holds more forts. Modern spelling seems to be Amer, not Amber. Amer and Amber Fort refer to the same place, though. So no need to worry if you are visiting the right site. As I did for a while. I visited 4 sites of this WHS in December 2011-January 2012. There are several forts in Rajasthan but the ones inscribed in this WHS are really unique. My personal favourite is Jaisalmer Fort in the Thar Desert close to the Pakistan border. It is special because it is still inhabited and the people there are really special. Hopefully sanitation problems and refuse collection will improve thanks to UNESCO but I really hope that the rumours of Jaisalmer becoming a "tourist attraction" meaning that the locals would be "accommodated" in apartments "outside" the city walls does not materialise (similar to what has happened in Bagan, Burma or Angkor Wat, Siem Reap). Jaisalmer Fort is special and unique to me because it is still inhabited after hundreds or thousands of years. I also visited Amber Fort outside Jaipur (entering the fort gate on a painted elephant like a maharajah), Ranthambore Fort, and Chittorgarh Fort with the claustrophobic Victory Tower. Chahar Bagh Gardens: Amber Palace "The garden, located between the Jai Mandir on the east and the Sukh Niwas on the west, both built on high platforms in the third courtyard, was built by Mirza Raja Jai Singh (1623–68). It is patterned on the lines of the Chahar Bagh or Mughal Garden. It is in sunken bed, shaped in a hexagonal design. It is laid out with narrow channels lined with marble around a star-shaped pool with a fountain at the centre." 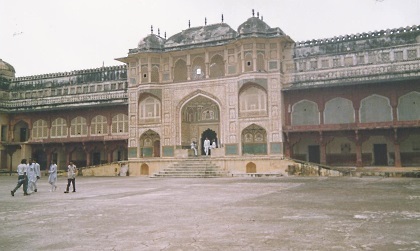 Indo-Islamic architecture: Amber - Built in 1592 by a Rajput commander of the army of the Mughal emperor Akbar the fort/palace contains a mixture of Indian and Mughal architectural styles. Jainism: Jaisalmer, Ranthambore, Kumbhalgarh (Bawan Devi Temple) and Chittorgarh. 186 Community Members have visited.